In the years we have been an Australian Labradoodle Breeders we have seen the Australian Labradoodle become one of the most famous pet dog varieties on the planet. 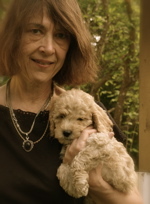 After people decide that they would like a Labradoodle puppy there has been a steep learning curve for people trying to do research on what would be the best sort of labradoodle puppy to add to their family. This is really understandable. The development of any new breed of dog has not been without growing pains. What is an “F1” and is it a good thing? “F1” is the term geneticists use for first cross. An F1 Labradoodle is the cross between a purebred Labrador Retriever and a poodle. In the search to find a good, allergy friendly Australian Service Dog poodles were crossed with labs. The breeders achieved mixed results. Unpredictable results are why people warn us about cross breeds. That being said, there are many marvelous F1 Labradoodles as good breeding is only part of the equation. Early socialization, nutrition, and the puppy training that families continue all go to make up the great dog we all wish for. An F1B Labradoodle, How About That? 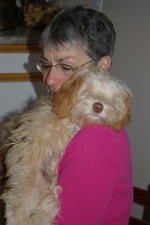 An “F1B” is a first cross Labradoodle as I just described crossed with a Poodle. It could be with a Labrador to qualify as an F1B but then the coat would be lost. According to the International Labradoodle Association the results for the F1B are mixed as it is not the breeding of like dog to like dog. The difference might be surprising because at the two research centres, Tegan Park and Rutland Manor in Australia the quest to develop a reliable Australian Allergy friendly service dog involved a long journey. An Australian Labradoodle is a dog that carries the dna of the Poodle, Labrador Retriever, the dear old Cocker Spaniel and Wheaton terrier. Every breed has several types of dogs in the foundation. 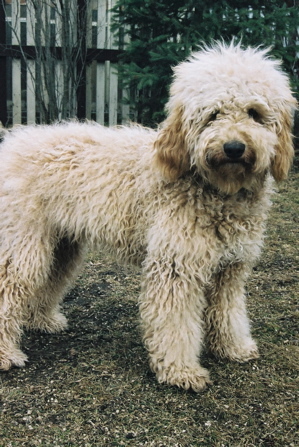 If an Australian Labradoodle is crossed back to a Poodle to ensure the coat it is still considered an Australian Labradoodle. The much prized Australian Multigenerational Labadoodle or ‘Multi gen’ is the result of breeding two Australian Labradoodles. The farther you go from the original foundation breeds the more certain you are of the result of the mating. The Merriam-Webster dictionary defined the term purebred in 1852. It was “a breeding from a recognized breed, strain or kind without the admixture of other blood over many generations.” The AKC in their foundation service requires four generations of like to like matings. The International Labradoodle Association declared recently that once the Australian Labradoodle has been bred to an Australian Labradoodle in four consecutive matings it will be considered to be pure bred. In our breeding program we have both multigenerational and pure bred Australian Labradoodles. Our breeding stock comes from the developer of the breed, Rutland Manor and Tegan Park in Australia.